Earn and deposit points each time you get a BOTOX® Cosmetic (onabotulinumtoxinA) treatment from a participating physician (as long as it has been 3 months since you last received points for a BOTOX® Cosmetic treatment). This program is Free. Please call us and we will be glad to sign you up or click here to sign up. It’s free to join, and you’ll receive an instant $20 treatment certificate when you sign up, plus access to exclusive perks and discounts on treatments you love. You also have the opportunity to start raising your status level for even more rewards. 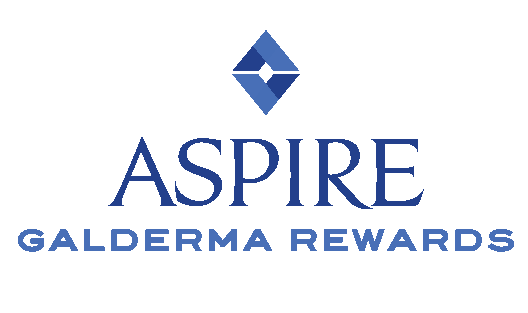 It’s easy to redeem your points for treatment certificates that provide valuable savings on Galderma aesthetic treatments at our practice. You are rewarded for maintaining your treatments. Receive points every time you visit our practice for a Galderma aesthetic treatment. Want to add someone to your aesthetic inner circle? You’ll receive 100 reward points for each referred friend who joins the program, up to five (5) friends in a calendar year. Galderma provides a comprehensive portfolio of aesthetic treatments that give you subtle, natural-looking results. We can help guide you through the facial aesthetic journey that’s right for you. Prescription Dysport temporarily improves the look of your moderate to severe frown lines between the eyebrows. With over 30 million treatments worldwide and counting1, the Restylane line of hyaluronic acid fillers provides natural looking results by smoothing away facial wrinkles and folds and adding volume to lips (Restylane), providing subtle lip enhancement and smoothing the lines around them (Restylane® Silk), and adding lift and volume to the cheeks and the facial wrinkles and folds (Restylane® Lyft). Sculptra Aesthetic works gradually to give you subtle results over time — without giving you away. Want to correct the deep folds between your nose and mouth, the lines framing your mouth, or your chin wrinkles? Call us to schedule a consultation about Sculptra Aesthetic. 1. Data on file: Fort Worth, TX: Galderma Laboratories, L.P.
2. Data on file. MA-32418 Study Report. Fort Worth, TX: Galderma Laboratories, L.P., 2017, Data on file. MA-30083 Clinical Study Report. Fort Worth, TX: Galderma Laboratories, L.P., 2017. We want to make your birthday special by offering you $75 OFF a Cosmetic Procedure (Fillers, injectable, laser..) AND $25 OFF an Aesthetic Treatment (Peel, facial…). 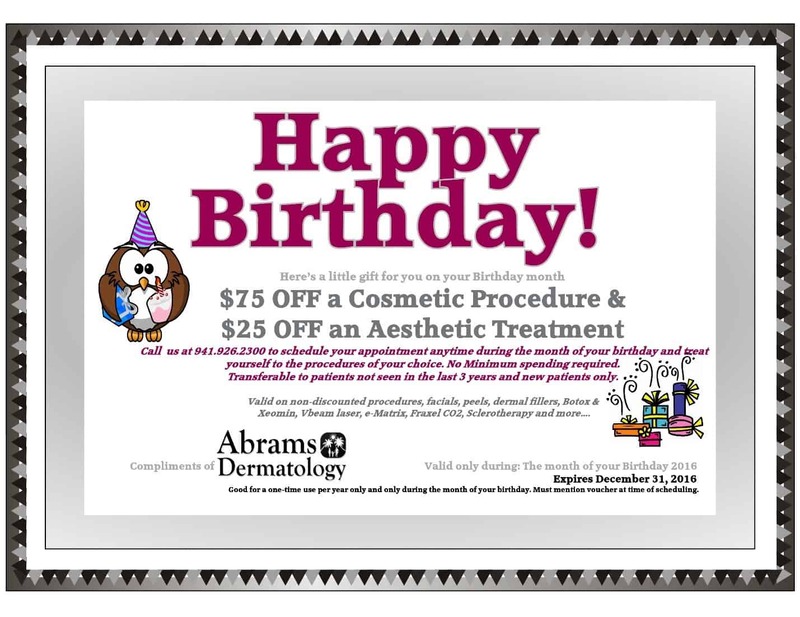 Schedule an appointment during the month of your birthday and treat yourself to the procedures of your choice. Mention this offer at the time of your call. No minimum spending required! Facials starts as low as $65! Valid on all non-discounted procedures: Facials & Peels, Microdermabrasion, Dermaplaning, Microneedling, Rejuvapen, Laser Treatments, V-Beam, VI Peel, photodynamic Therapy, Co2 Laser, eMatrix, Facial Fillers, Botox, Xeomin, Sculptra, JUVEDERM, Restylane, leg & Facial vein Removal and much more! 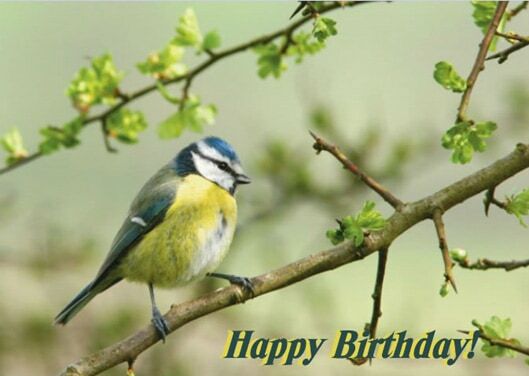 We look forward to seeing you and Happy Birthday! Free Consultation with Catherine Deans, L.E. Late & Lunch Hour Appointments Available. Not redeemable for cash. No cash value. One voucher valid on one treatment. Vouchers valid for a one-time use during the whole month of your birthday. Offer valid upon mention of this voucher. Cannot be combined with any other discounts. While supplies last. Other restrictions may apply. We reserve the right to not accept voucher. Can be transferred to a non-current patient (patient not seen since the last 3 years). To express our appreciation, we are pleased to offer you and your friend(s)/ family member(s) (new patient only) a $20 discount for every friend/ family member referred by you for any aesthetic or cosmetic procedures. To receive credit to your account, you or your friend(s)/ family member(s) (new patient) must present this card at the time of the friend’s first appointment. Only one $20 credit per friend(s)/ family member(s) (new patient) referred. There is NO LIMIT to the amount of $20 credit you can receive. 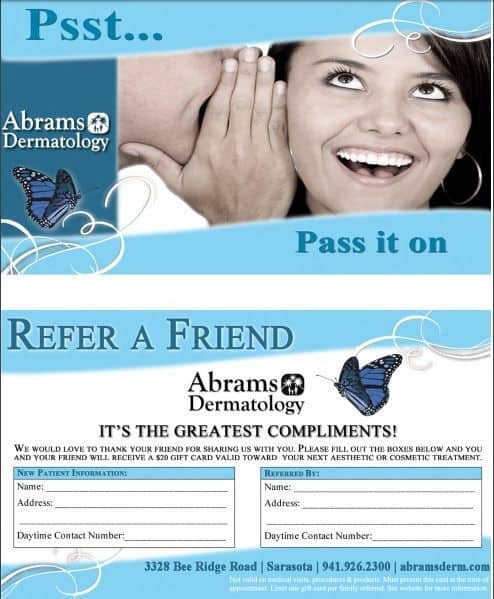 You may give this “REFER A FRIEND” card to as many of your friends and associates as you wish, so you can all save money. This card is not valid for Medical Visits, procedures, prescriptions, and products. Cannot be redeemed for cash. Credit valid after first treatment has been paid in full. Schedule your treatments accordingly and SAVE!!! 15% OFF your next treatment within 3 months. 10% OFF your next treatment within 6 months. 5% OFF your next treatment within 1 year. Subsequent treatment must be identical area and product. 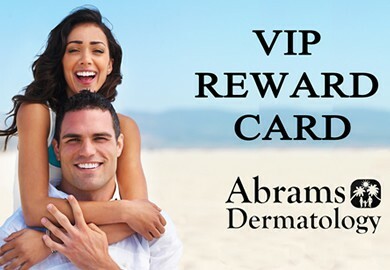 VIP only valid on two non-discounted treatments. Percentage calculated on lower amount treatment. Cannot be combined with any other discounts or reward programs. Other restriction may apply. The program is subject to change or cancelled without notice. We offer medical, cosmetic, and aesthetic treatments. Many of these treatments complement each other. For example, a medical patient with acne may be recommended to have facials and peels during his treatment to help accelerating the clearing of the skin faster and reduce acne scars. Once the acne is controlled, cosmetic treatments such as eMatrix, CO2 or fillers may be recommended to restore the skin to a healthier look and reduce acne scars formed over the years. 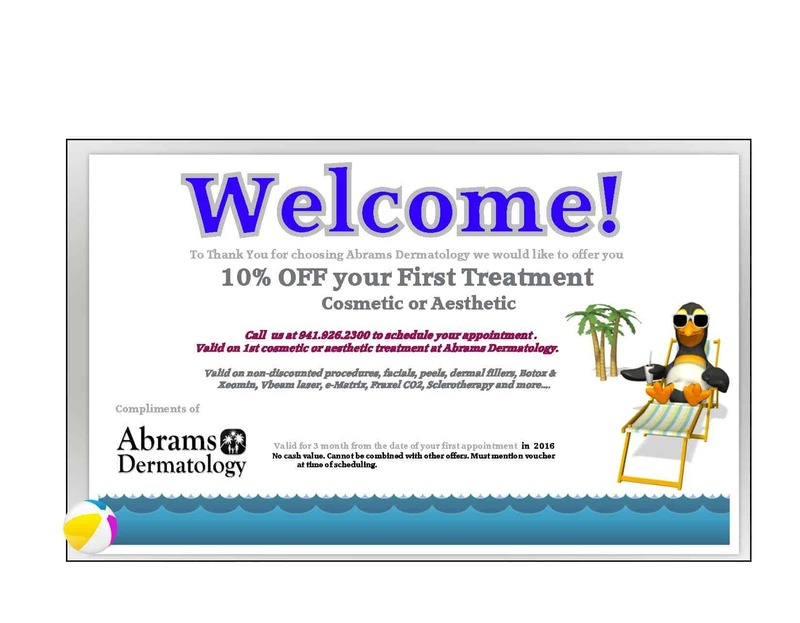 To thank our medical patients from choosing Abrams Dermatology, we offer every new patient a 10% OFF the first cosmetic or aesthetic treatment. We offer free Consultation with Catherine Deans, L.E. to determine the best treatment for each patient’s needs. We offer Late & Lunch Hour Appointments. Call us at (941) 926.2300 to schedule an appointment during the first three months of your medical visit and redeem this voucher. This voucher can also be transferred to any new patients as well.